U.S. safety regulators have opened a preliminary evaluation into two fires in Tesla Model S electric cars. 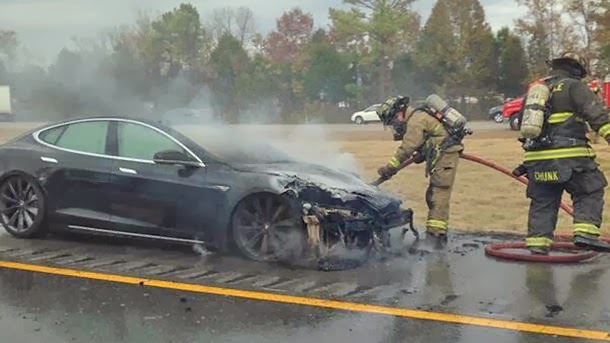 The National Highway Traffic Administration says fires broke out in two of the cars' batteries after the undercarriage hit road debris. The debris damaged the batteries and caused a thermal reaction and fires. No one was hurt in the fires. The probe affects more than 13,000 cars sold in the U.S. The agency says it wants to examine risks from the undercarriage getting hit. Tesla's batteries are located beneath the passenger compartment and protected by a quarter-inch-thick metal shield. In 2011 the NHTSA opened a similar preliminary evaluation into the Chevy Volt following a severe-impact lab test on a battery pack that resulted in an electrical fire six days later. This led to GM adding further enhancements to the vehicle structure and battery coolant system in the Chevrolet Volt that would further protect the battery from the possibility of an electrical fire. Only 3 months ago the NHTSA awarded the Tesla Model S Five Star ratings in all NHTSA crash tests.